Sofia Coppola ('Lost in Translation'), Patty Jenkins ('Monster'), Mira Nair ('The Namesake'), Deepa Mehta ('Water'), Aparna Sen ('Mr and Mrs Iyer')... If one were asked to name popular women filmmakers, the aforementioned would be just a handful of names that come to mind. World over, the film and entertainment industry is dominated by men. Exciting projects, big budgets and accolades are usually reserved for men. As a result, women filmmakers face an uphill task to make their presence felt. However, things are changing. Women are cracking the glass ceiling as production company heads, directors and technicians. And, now, even the Himalayan kingdom of Nepal, has its first woman director in Suchitra Shrestha, 29. Even though women form nearly 51 per cent of Nepal's 27 million population, until recently there were no women directors in Kollywood, Nepal's film industry. In 2002, Shrestha created history by becoming the country's first woman director with the film, 'Prem Yuddh' (Battle of Love). But, now, even five years later, she is still the only one. Shrestha attributes her success and her choice of profession to her parents, who brought up their three daughters and two sons without discrimination. "We were given the freedom to do whatever we wanted," she says. "When I finished my schooling in Ilam and wanted to go to Kathmandu to pursue my studies further, they agreed immediately." While studying in Kathmandu, Shrestha was drawn to journalism. She began writing for weeklies and also worked with a local film magazine, 'Cinestar'. It was during her stint as a reporter - which brought her in contact with various actors, producers and filmmakers - that she developed a keen interest in filmmaking. She took her first steps towards a film career when she wrote 'Akalpit' (Unimagined), based on a true incident in her community. Inter-community marriages are not very popular in traditional Nepal and as a young girl, Shrestha had been shaken by the suicide of a girl from the Newar community. The girl had married outside her caste but the marriage was not a happy one and she went through rejection, unhappiness and despair before she finally took her life. 'Akalpit' was followed by several scripts, the most memorable of which was 'Bhai- tika' (Brother's Day), which was serialised by the state-run Nepal Television. The serial made Shrestha a household name and so, when she decided to direct a full-length feature film, she did not face the problem of garnering the necessary finances, as most newcomers in Kollywood usually do. While still writing scripts, she became acquainted with director Ramesh Rai, from whom she learnt the basics of direction. 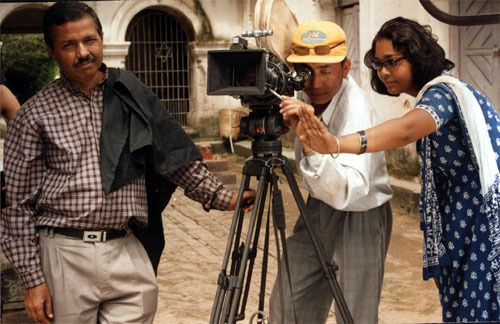 But when she decided on becoming a full-time filmmaker, Shrestha enrolled into a filmmaking course to gain hands-on experience. For her debut venture, 'Prem Yuddh', Shrestha once again chose a woman-oriented story. In the movie, the protagonist, a strong-willed woman, fights for equal rights for women and is later treated at par with her husband. "The message I wanted to convey was that parents-in-law should love their daughters-in-law more than their sons," says Shrestha. Though there have been several special screenings of 'Prem Yuddh', it has not been released commercially due to the queue system in Nepal's theatres. As per the queue system, the Chalachhitra Nirmata Sangh - the umbrella organisation of film producers in Nepal, draws up a roster for the screening of new films. Though mostly guided by the completion dates of movies, the screening is also influenced by how well known the director and the cast are. Then there was the setback of the Maoist insurgency in 2003. With hit-and-run attacks in the capital, people had stopped going to cinema halls. However, Shrestha now plans to release the movie by May-end when it will run for three weeks in Kathmandu's Bishwajyoti Theatre. So, how have family and friends reacted to her achievement? "My husband, who is a teacher, and parents are very supportive. Either he or my mother babysits my seven-year-old son when I am away," she says. "Suchitra has potential, but it is tough for women to make it big in our industry. Producers are wary about investing and newcomers are rarely encouraged. There is also a strong gender bias. Though Kollywood accepts women as artistes, it is not familiar with the concept of women directors," says Ramesh Rai. 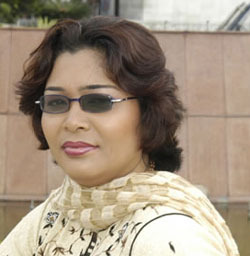 Has Shrestha ever faced any problem with male colleagues? "As far as work is concerned, I am treated with utmost respect and consideration. Like any other male director," she replies. When she is behind the camera, her main objective is to bring to light women's issues. "I look at social issues, especially the imbalances and distortions in society. My aim is to convey the message that there should be some change initiated to see that these imbalances are corrected... and that it is women who will be the catalysts of this change," she says. Shrestha has currently begun work on her second project. Titled 'Chithi Timi Lai' (A Letter for You), the new film stars Nepal's reigning star Rajesh Hamal. However, the shooting will start only around early June. "Shrestha has to live up to a lot of expectations with her new film," says Babita Basnet, who edits the weekly 'Ghatana R Bichar', and heads Sancharika Samuha, a forum of women journalists in Kathmandu. Why is working in the film industry still considered objectionable by the general public? Basnet blames the negative perception people have about the film world. "Educated families are loath to send their daughters into the film industry because of the casting couch belief," she says, "Actors, directors, technicians - everyone involved in the industry - should work together to create an environment of respectability." Basnet believes film journalists can play an important role in promoting the industry as a viable and respectable career option for women. "Much of Nepal's film journalism is centered on gossip," she says, "Instead, they should concentrate on talent and skills and make people realise that it is a profession just like any other."